Tromsø in Northern Sami and Tromssa in Kven) is a city and municipality in Troms county, Norway. The administrative centre of the municipality is the city of Tromsø. Tromsø city is the ninth largest urban area in Norway by population, and the seventh largest city in Norway by population. It is the largest city and the largest urban area in North Norway, and the second largest city and urban area in Sápmi (following Murmansk). The area has been inhabited since the end of the ice age, and the Sámi culture is the first known culture of the region. Speakers of Norse, the ancestor of Norwegian brought their culture to the area during the migrations of the Vikings before AD 890, when Ohthere's settlement existed to the south of today's Tromsø. The first church on the island of Tromsøya was erected in the 13th century, and the area one of Denmark-Norway's very northernmost territories not contested by Russia. During the 1600s, Denmark-Norway solidified its claim to the northern coast of Scandinavia and during this period a redoubt, Skansen, was built. Tromsø was issued its city charter in 1794 by King Christian VII. The city was established as a municipality 1 January 1838 (see formannskapsdistrikt). The rural municipalities of Tromsøysund and Ullsfjord, and most of Hillesøy, were merged with Tromsø on 1 January 1964. The population of Tromsø municipality is 63,596, and the urban area, Norway's ninth most populous, is home to 53,622 people. 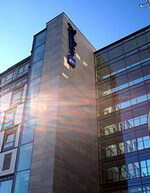 The Radisson Blu Hotel is a modern, seafront hotel, with mountain views, centrally located in downtown Tromso, two kilometres from the Arctic Cathedral. The hotel offers many dining options; the Grillen Restaurant serves an extensive range of continental and international cuisine, including an arctic menu, in a traditional Scandinavian-style setting, and is open for breakfast, lunch and dinner; The Skaidi serves light snacks and a wide range of coffees and drinks in the lobby bar, with a Sami-inspired theme; Yonas Pizzeria and Catering has a cellar setting and serves a delicious range of pizzas, with a children's play area; and The Rorbua Pub, as featured on national TV, serves soups and stews in a fisherman-style shack, with live entertainment and a friendly atmosphere. After a day exploring the beautiful surrounding area, guests can unwind in the sauna, and relax with a drink in the hotel's bar. 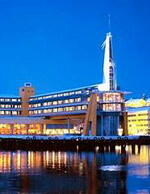 Rica Ishavshotel features eye-catching modern architecture in steel and glass and enjoys a fine position on a quay with views over the Tromso harbour and bridge. The Polaria Aquarium is one kilometre from the hotel, and the Ishavskatedralen Arctic cathedral is 2 kilometres away. A complimentary buffet breakfast, featuring traditional Norwegian delicacies, is served each morning. The Rica Ishavshotel's Brasserie Restaurant offers traditional cuisine and specialities from the north of Norway in a contemporary setting, and The Gallionen Restaurant serves both à la carte and café-style menus and features an open fire and spectacular sea and mountain views. The Galleriet Whisky Bar and the Skibsbroen Cocktail Bar both feature stunning views over the Arctic cathedral and Tromso Bridge. Take the Fjellheisen Cable Car from the town, which travels the 420 metres to the summit of Storsteinen in 5 minutes, where the views across Tromso and the surrounding fjords and islands are breathtaking. 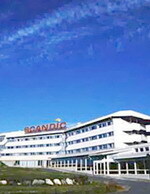 The Scandic Tromsø is a modern hotel set on the west side of Tromsø Island with views of the Kvaløya mountains, three kilometres from the town centre. Guests can relax with drinks and snacks in the Pelikan Lobby Bar or unwind in the sauna. The Restaurant Maken is open for breakfast, lunch and dinner and serves al la carte international dishes with a taste of the Arctic. There is a playroom for children, available during the summer months, and for guests arriving by car there are 200 complimentary parking spaces next to the hotel. Multilingual staff at the front desk can advise on local sightseeing hotspots. Nearby attractions include the botanic gardens one kilometre from the hotel, and the Arctic Cathedral, four kilometres away. Tromsø-Langnes Airport (TOS) is one kilometre from the Scandic Hotel Tromsø, around five minutes by car. 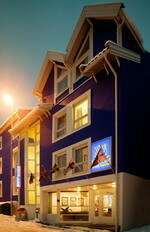 Viking Hotell Tromso is located in the centre of Tromso, Norway, on the main shopping street, Storgata. The Polar Museum is 100 metres away and Tromso Cathedral is 500 metres away. Tromso - Langes Airport is four kilometres away. Multilingual staff can offer tour advice and a safe-deposit box at the 24-hour front desk, and 24-hour room service is available. Parking is provided nearby. Traditional Nordic dishes are available at Viking Hotell Tromso's restaurant, and a complimentary breakfast is served each morning in the hotel breakfast room. Viking Hotell Tromso offers discounts for a nearby fitness centre. Activities available nearby include cross- country skiing, ice fishing, and island excursions. The 25 guestrooms all have air conditioning and amenities include complimentary wireless Internet access, satellite television, minibars, and hair dryers.